Exhibits include Native American Artifacts, Little Falls Diamonds, from the First Cheese Market in the United States. Our Current Exhibits include the Urban Renewal Exhibit and our Vietnam War Exhibit. 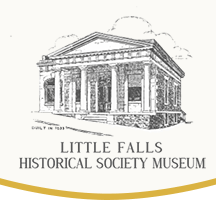 Originally an 1833 bank, the building where The Little Falls Historical Society Museum is located was converted and restored to house thousands of artifacts, family records, and relics of the past. The museum is an educational, eye-opening experience, suitable for all ages.